How to convert float to long or int data type in Java? Yesterday one of the new joiner Java Trainee Engineer from our team came to me and asked about how do you I convert a float variable into long or int data type? He was storing some values coming from another system in the database and only wanted to store value before the decimal point e.g. he was getting "3.144" and he wants to convert it to "3" to store into database. The good thing was that API was returning a float primitive value and you don't need to convert a String to float etc. I asked him whether he needs routing or not, which he wasn't sure but it turns out that he didn't need that. I explained to him how to do that and that's what you will find in this article as well. In short, there are 3 ways to convert a float value into long or int in Java, but we will only focus on long data type part. The first way to convert a float data type into a long value is to auto-box float primitive into Float object and calls the longValue() method. This is a more structured way as other ways are simply to cast a float to long or int to get rid of decimal points. You can also write the Java program by following these tips to convert a float value to an int by replacing long method to their int counterpart. Alternative you can use Math.round() and then cast back to long data type. 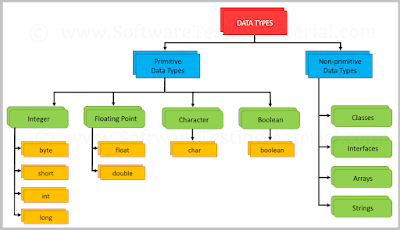 There is no doubt, the second approach is the easiest if the requirement is simply getting rid of anything after decimal point but if you need rounding then the third approach is the right way to convert a float data type to long in Java. 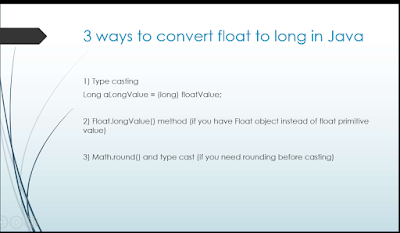 In this tutorial, you will learn all three ways to perform float to long conversion in Java. Btw, If you have just started learning Java or want to fill gaps in your knowledge about Java programming then I suggest you join a comprehensive course like The Complete Java Masterclass on Udemy. It's not costly, you can get it in the cost of a coffee and learn Java better. Let's see different approaches to converting a float value to long or int in Java and understand the pros and cons of each approach. Java supports type casting and that should be the standard way for data type conversion. It will not do anything special but just discard anything after the decimal point so you will have value 3 in the fromFloat variable. If you want to convert float to int then instead of casting to long you should cast float into an int. This is the easiest way to do this conversion. If you want to learn more about type casting in Java then I also suggest you take a look at Java Fundamentals: The Java Language course on Pluarlsight. Btw, you would need a Pluralsight membership to access this course, which costs around $29 monthly or $299 annually. I have one and I also suggest all developers have that plan because Pluralsight is like NetFlix for Software developers. It has more than 5000+ good quality courses on all latest topics. Since we programmers have to learn new things every day, an investment of $299 USD is not bad. Btw, it also offers a 10-day free trial without any obligation which allows you to watch 200 hours of content. You can watch this course for free by signing for that trial. This method is more suitable when you have a Float object rather than float primitive value. You can see the effect of rounding, in first example float was rounded-down and that's why a converted long value is 333 while in the second example it was rounded up and that's why the long value is 334. 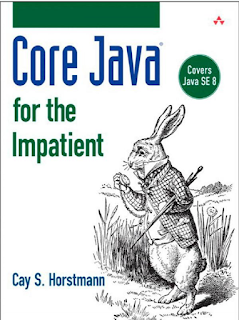 If you want to learn more about rounding and type casting in Java, I also suggest you take a look at Core Java for the Impatient book by Cay S. Horstmann, one of the better books to learn Java, which covers concept like this in good detail. 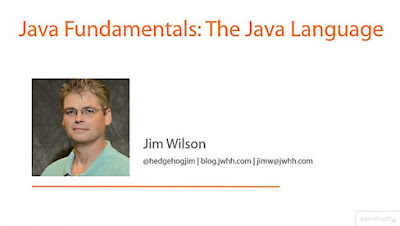 Here is the Java program which combines all three ways to convert a float to long in Java. You can see how they work and learn the technique to perform another similar conversion e.g. float to int, short, or byte or double to long, int, short and byte. That's all about how to convert float to a long data type in Java. Typecasting is the simplest and right way to do if your goal is just to get rid of decimal values. If you want to round before getting rid of decimal points then you can use Math.round() method. BTW, that's not the only way to round numbers in Java, but it works for most purposes. Thanks for reading this article so far. If you like this article then please share with your friends and colleagues. If you have any questions or feedback then please drop a note. If you like, you can also follow Javarevisited on Twitter, I only tweet about Java, programming and technical stuff. How to avoid deadlock in Java Threads?